Adult upperparts are streaked with dark to reddish brown, with gray cheeks, eyebrows, and central crown stripe. The tail is long and rounded at the tip. In flight, the tail often pumps up and down. Underparts are whitish, with light to heavy, brown to red-brown streaking. Sometimes the streaks combine to form a single, often rather blurry spot in the center of the breast. Note the white throat with heavy dark "whiskers" (malar stripe). Males typically sing from exposed perches. The song is three or four whistled introductory notes, followed by two slurred notes and a descending jumble of warbling whistles and trills. The call is a distinctive dull, nasal tchep. Similar species: Song sparrows display a lot of variation across their broad North American range. Savannah sparrows usually show yellow in front of the eye, have smaller bills, are paler, and shorter, notched tails. Vesper sparrows have a notable white eye ring and white edges to tail. Fox sparrows have bolder, blurrier breast streaks and are larger and usually redder overall. Lincoln's sparrows have finer streaking on the buffy breast, and well-delineated, dark-outlined buffy streaks on either side of the throat. Audio of a song sparrow in the wild. Associated with generally open habitats. In winter, common in weedy fields, streamside thickets, pasture/forest edges, and backyard bird feeders. Most abundant in river valleys and floodplains. 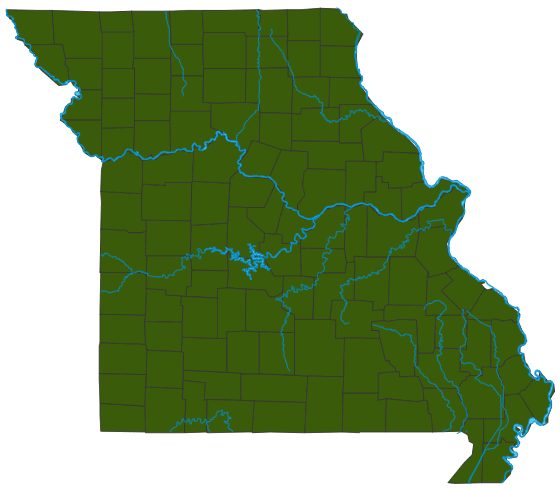 In summer, common in the plains of northern Missouri, and in willow marshes and wet meadows of the Osage Plains and in shrubby wetlands and roadside tangles near borrow ditches along highways in the Ozark Border and Mississippi Lowlands. Rare in the Ozarks. Insects, seeds, and fruits; visits bird feeders. Common winter resident statewide. As a summer (breeding) resident, common in the northern section, uncommon in the southeast, and rare elsewhere. Females build the cup nests, which are well-hidden in grasses, shrubs, or other vegetation, positioned either on the ground or in shrubs or small trees. The cup nests are made of dried grasses, bark strips, and weeds, and lined with finer grasses, animal hair, and other softer materials. Clutches comprise 1–6 eggs, which are incubated 12–15 days. After hatching, the young remain in the nest another 9–12 days. There can be up to 7 broods a year. It's been said that the male song sparrow "takes his singing very seriously." Humans take bird songs seriously, too. Animal behavior specialists have learned a great deal about how young male sparrows learn regional versions of their songs, and their findings about birds provide insights for how young humans learn language. Across its wide and diverse range, there are some 24 different subspecies of song sparrow. Their colors, bill size, and other characteristics vary in ways that suit them to their particular regional habitats, with paler, smaller forms in the desert Southwest, for example, and darker and larger subspecies along the Alaskan coast.